Prince Edward Island. Small Province. Big Cuisine. Even visiting chefs now call Prince Edward Island, “Canada’s Food Island”. That was the term used by Montreal celebrity chef and “Chopped Canada” judge Antonio Park at one of PEI’s exciting new Fall Flavours culinary events. “Chopped Canada,” a weekly show aired on the Food Network, pits four chefs against the clock with a mystery basket of ingredients. A great Canadian festival, and now in its 11th year, Fall Flavours has evolved into one of the world’s premier, month-long culinary festivals. It is a unique culinary adventure that highlights authentic Prince Edward Island tastes and traditions. Surrounded by the sea, PEI and its cuisine naturally emphasize seafood – lobsters, scallops, oysters, mussels, crabs and halibut. But PEI potatoes are among the best on the planet and, in recent years, Island beef and pork have developed an enviable reputation. With a population of just over 150,000, Prince Edward Island punches well above its weight for tourist attractions (think Anne of Green Gables) and now also for world-class cuisine. We were among those seafood enthusiasts who spent several adventure-filled days in central and eastern PEI sampling and savoring after taking a short ride on the ferry to Prince Edward Island. Getting to the island is an adventure. Many arrive and leave by the 8-mile toll bridge from New Brunswick (you only pay when leaving). We chose a more leisurely route by taking the car ferry to Prince Edward Island from Nova Scotia and leaving by the bridge. Taking a ferry to Prince Edward Island and arriving at the eastern end of the island is a visual delight. The red soil, rolling hills, luscious green fields and well-kept homes are a gentle reminder that this is a different place with a more tranquil way of life. The sandstone cliffs and well-preserved lighthouses just add to the relaxing atmosphere. It was close to the nearby Point Prim Lighthouse that our seafood feast began. 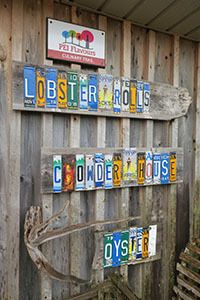 The Point Prim Chowder House is an old-fashioned eatery with signs made from license plate letters. 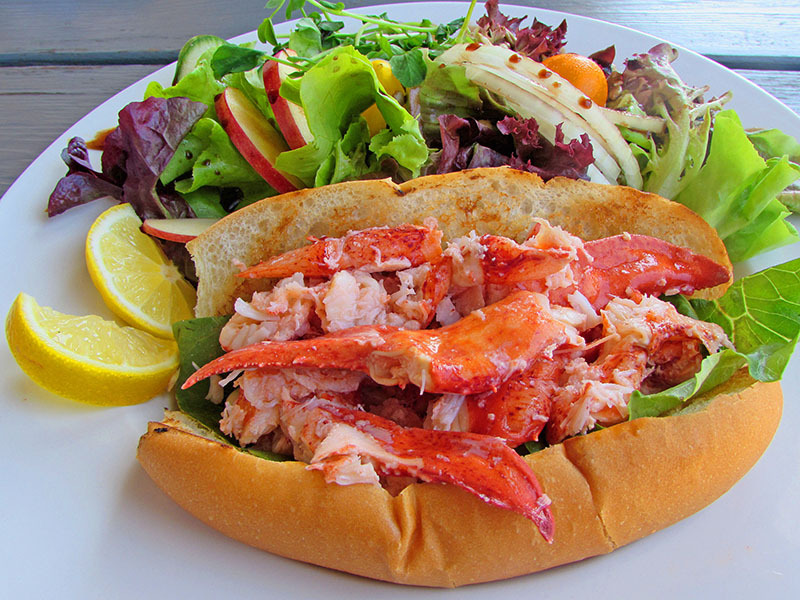 The seaside restaurant offers both hot and cold lobster rolls. Their Steamer Pot, featuring clams, mussels, fresh fish and snow crab legs is a popular choice. Everything was delicious and served as an excellent beginning to four days of seafood indulgence. Like most visitors we stayed in Charlottetown, the laid-back capital city with a population less than 45,000. In recent years it has evolved a sophisticated culinary scene with many ethnic restaurants, a wonderful twice-a-week farmers’ market and even a great downtown coffee house (Receiver Coffee). We stayed at the convenient, modern Hotel on Pownal, recently completely renovated. It’s owned by the Murphy clan, a PEI family that’s had a major impact on regional cuisine and accommodation. We particularly enjoyed the evening happy hour with complimentary snacks, wine and excellent Gahan craft beer, made on PEI (the Blueberry Ale was especially tasty). 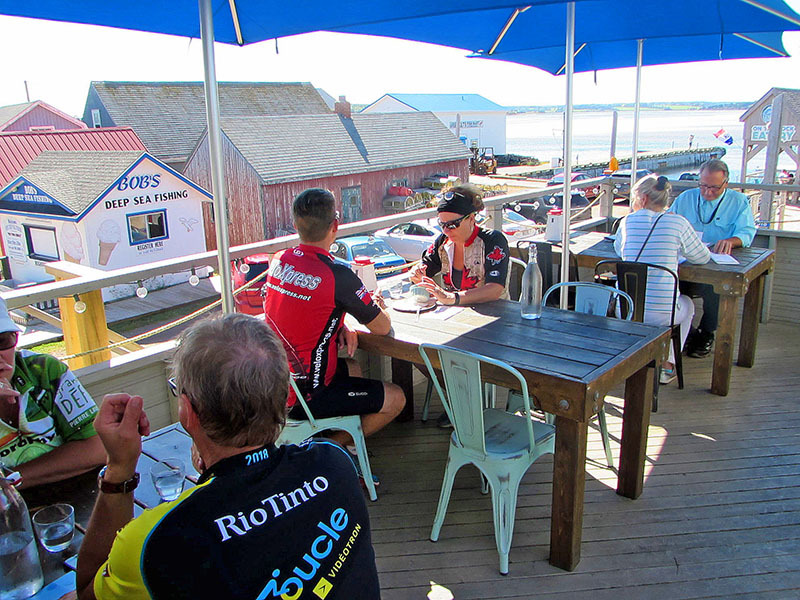 During our visit we dined at several excellent Price Edward Island restaurants. Our dinner choice that evening was the nearby Sim’s Corner Steakhouse and Oyster Bar (another Murphy property). We enjoyed a succulent New York striploin (with roasted baby red potatoes and chanterelles) and the freshest, tastiest halibut we’ve ever had. Very impressive. The following morning, after a fine complimentary breakfast at the Hotel on Pownal, we felt energetic and headed back to the eastern end of the island and a long walk in Greenwich PEI National Park. A serpentine trail takes visitors over a pond with its extensive floating boardwalk and on to spectacular sand dunes by the beach. 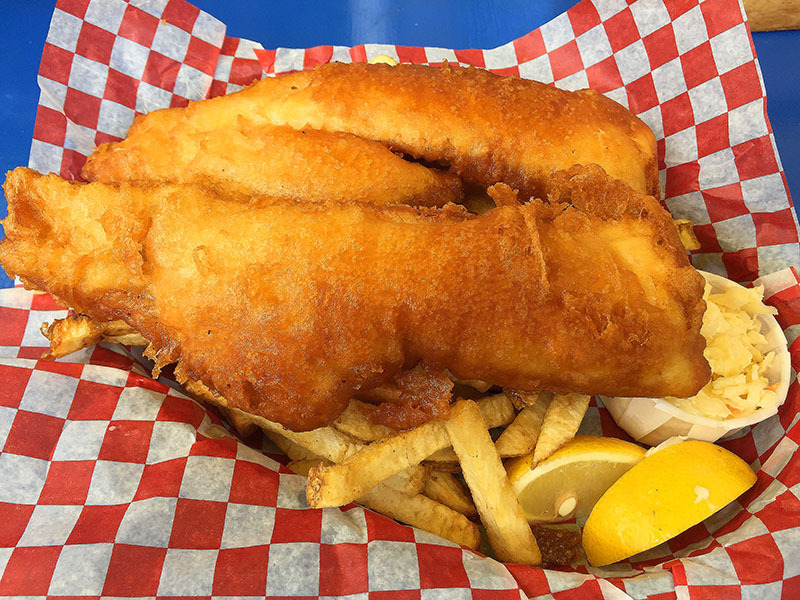 For lunch we chose Rick’s Fish ‘n Chips in the village of St. Peter’s Bay. This compact main street eatery features unusual curried seafood chowder and exquisite fish, with thin, tempura type batter and hand cut chips, some of best we’ve ever enjoyed. We were very full but wanted to check out a new, ethnic restaurant in Souris, the town with daily ferry service to Prince Edward Island from Quebec’s Magdalen Islands. Poké Shack has Hawaiian/Japanese cuisine, mainly seafood (local raw tuna is a feature) or chicken, served in a bowl with rice and greens. That evening was the time for celebrity chef Antonio Park to shine. The new Fall Flavours event was called “An Exclusive Evening at Red Shores”. This is Charlottetown’s harness racing track overlooking the harbor and has a three-tiered “Top of the Park” eatery, another fine Price Edward Island restaurant, where Chef Park and Red Shores’ Executive Chef Andrew Smith produced a five-course, gourmet feast with wine pairings. Chef Park likes to use abundant but little-known PEI kelp in his dishes and it did add a wonderful flavor component to the mushroom soup, the spicy braised pork belly in a steamed bun, the tuna carpaccio and the steamed fresh halibut. For dessert the chefs offered an excellent Grand Marnier cheesecake with sorbet. The next day we continued our culinary tour with a stop at Glasgow Glen Farm, a major producer of Gouda cheese. They have several tasty varieties for sampling and a chance to view their cool aging room filled with rounds of cheese. For lunch we headed to another first-rate PEI restaurant, the Blue Mussel Café, right on the harbor front in North Rustico. No deep fried seafood here, just excellent mussels steamed in Gahan Blueberry Ale, a tasty lobster bubbly bake and lobster rolls crammed with meat. 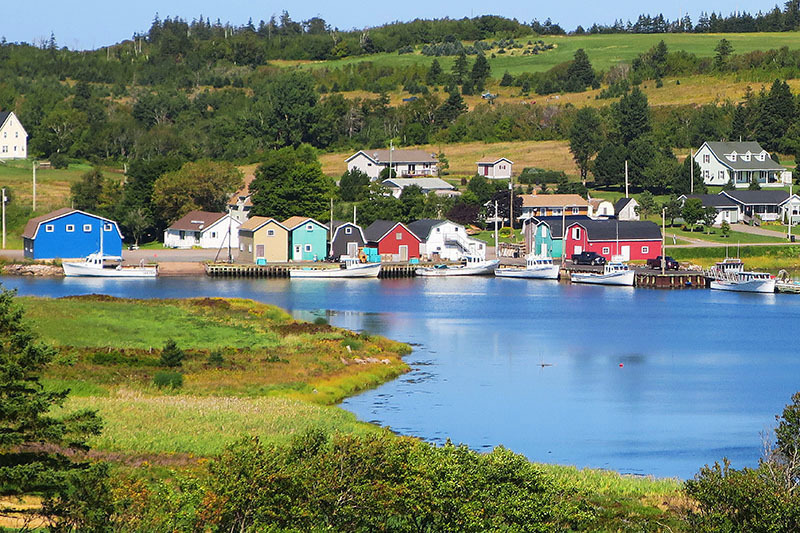 On the way back to Charlottetown we stopped for an overview of French River, one of the most picturesque fishing villages on the island. 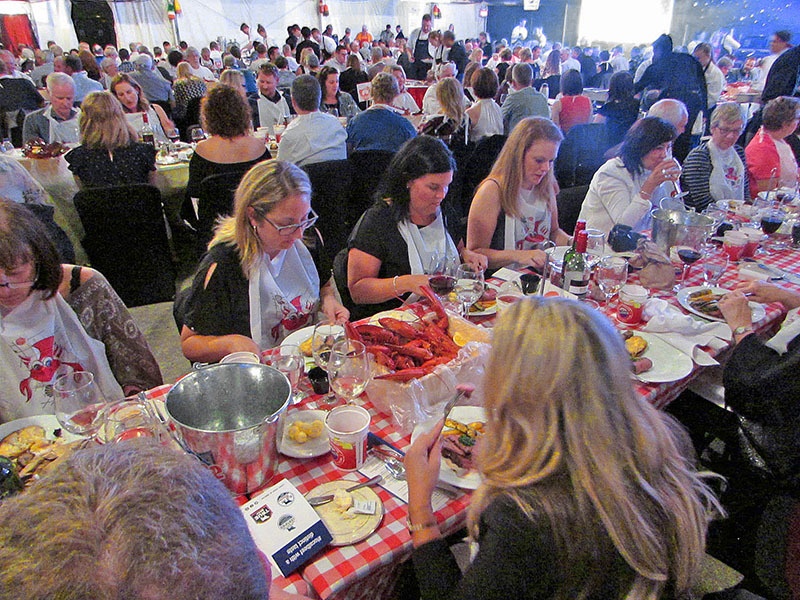 In the capital city that evening, the highlight of our PEI culinary visit was the annual Feast and Frolic, a major event of Fall Flavours and the International Shellfish Festival. Hosted this year by “Restaurant Makeover” and “Chopped” celebrity chef Lynn Crawford, it attracts several hundred Islanders and visitors for a lively evening of entertainment (bagpipes, fiddles and highland dancing) and limitless amounts of fresh seafood. 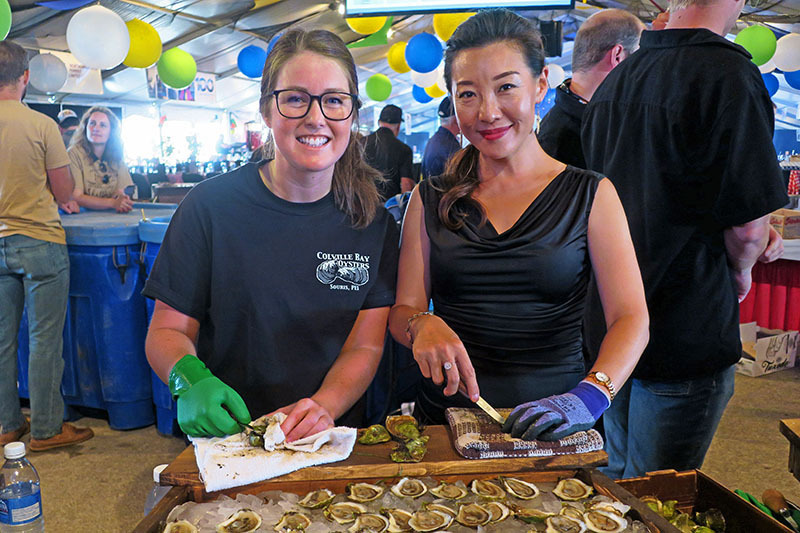 Most dramatic was the World’s Largest Oyster Bar, where twenty Island producers form a circle to shuck and display thousands of the succulent Prince Edward Island oysters. One guest boasted that he devoured eighty of them! There were also three competing seafood chowder chefs, each offering thick, savory chowder bursting with lobster, whitefish and scallops. The sit down portion of the dinner was almost anticlimactic as the efficient wait staff gave everyone a bowl of Prince Edward Island mussels, a plate with a slice of tender Island beef and a whole, cracked lobster with clarified Island butter. A truly amazing banquet! It was hard to leave Prince Edward Island the next day but before we headed towards the billion dollar bridge to New Brunswick we stopped at the famous Cows Creamery factory just to the west of Charlottetown. Cows was rated as the best ice cream in North America by Tauck Tours and, with its rich formula, it’s easy to see why. We enjoyed a cone and had a self-guided tour of the factory where, on this day, mango sherbet was being made. We couldn’t depart PEI without a final lobster roll and we found the best ones yet at another delicious Prince Edward Island restaurant, the Lobster Barn Pub & Eatery on the wharf in the artist’s haven of Victoria by the Sea. Full claw and tail chunks atop a homemade sweet mayonnaise on a fresh roll. 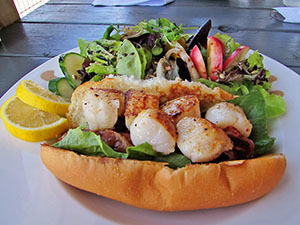 The Lobster Barn also served an extraordinary scallop roll with bacon. Filled with scallops for just $16. A great value and a perfect ending to our short but very satisfying visit to Canada’s Food Island.